Which rail routes in Europe over 100km are typically the lowest cost per km? Answers don't need to be precise of course, as prices will change with season and other factors. And answers should not include expensive unlimited rail passes. The total cost per route should not exceed 200EUR. This is strictly a question about cost per km. I am curious what answers will show up. My best possibility this far is the train Kharkiv-Uzhhorod. If I try to book that for next Tuesday (train 235O, leaving Kharkiv at at 10:31 and arriving in Uzhhorod the next day at 12:10) I get a price of 465 UAH, which corresponds to about €16. The distance according to Google Maps is slightly under 1300km, giving me a price tag of about €0.0125/km or €1.25 per 100km. In Western Europe the best candidates are the French OUIGO TGV's. The longest routes appear to be Marne la Vallée to Montpellier and Marseille. When looking for the cheapest prices I find tickets for €10 to Montpellier and €15 to Marseille. This is when looking at the end of May in the middle of the week. Then, how far is this? I estimated using Google Maps and picking a route to Montpellier that passes Lyon like the train does. This is following A6 and A7. According to Google Maps the distance is 770km, which brings the cost to €0.013/km (or €1.3 per 100km). The cheapest route I've taken was €18 from Ljubljana to Budapest which is 462km according to Google Maps. That comes to 0.0389 €/km. The trip took 8 hours, so I suspect the railroad was not exactly straight between the 2 points, although there were no stops other than a few minutes for border crossings. The cheapest I've found is in northern Russia, from Воркута́/Вӧркута/Vorkuta (Komi Republic) – Коноша/Konosha (Arkhangelsk Oblast) , I find a ticket for a seat for 1399 RUB for 1559 km. That is €17.563, or 0.01127 €/km or 1.127 €¢/km. Further west, Göteborg – Narvik, booked early in the low season, I find tickets in a seat for SEK 562 (€60.13). The train travels via Stockholm, which gives a distance along the road is around 1900 km, along the railway should be similar. This gives a price of 0.03164 €/km or 3.164 €¢/km. Tickets are flexibly priced, so you might find cheaper tickets for specific routes and dates. Students and youths get a discount. Refundable tickets cost more (803 SEK / €86 for a seat or 898 SEK / €97 for the low-season connection I was looking at, mid-week in May which is 2–3 months away, but it depends on date and time). Stavanger – Bodø, I find minipris for 449 NOK, or €47.58, a seat for a journey taking more than 24 hours. Distance along a route similar to the train is some 1754 km, which brings the price of 0.02723 €/km or 2.723 €¢/km. The most expensive may be the Gornergratbahn, which costs CHF 43.00 (€39.73) for 9.3 km, or around €4.27/km. Not even British Anytime tickets reach that price level. But that's not a long distance rail route. For the most expensive long distance rail route, you should probably be in the United Kingdom. Bari Italy to Rome €35, Rome to Milan €35, Milan to Paris €35, Paris to Brussels €28, Brussels to Amsterdam €45. All tickets were individual, seperate from each other. There was about a day or two of stopover at each place. Also, the tickets were booked well in advance. In the morning I will add the KMs from Google, and will add the price/km. This answer is invalid, because you asked for Europe. But it may be interesting as a reference. 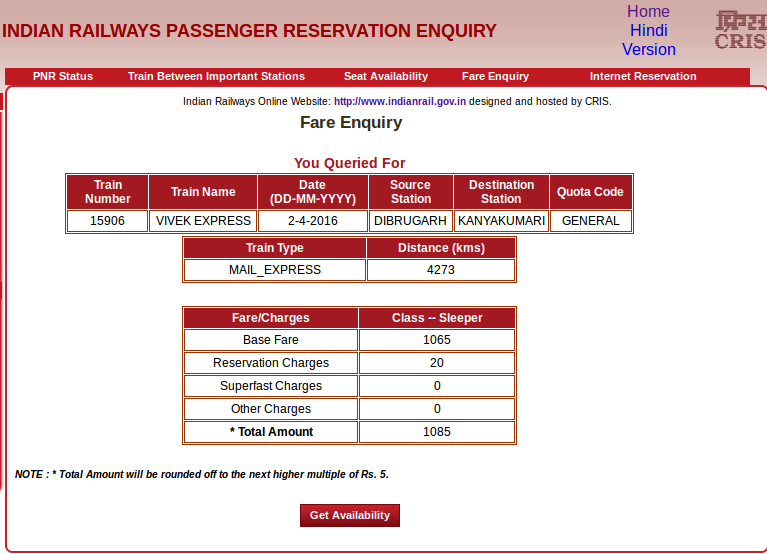 To find it, go to the Indian Rail website, click on Fare Enquiry, search for Train Number 15906, departure station DBRG, destination station CAPE, for a date such as 2 April, class Sleeper. The train runs weekly, according to Wikipedia. I have never been to India, but Seat61 tells me that sleeper class in India is not what it is in Europe. You might find even cheaper fares in hard-seating 2nd class and on slower trains. Not the answer you're looking for? Browse other questions tagged trains budget europe eurail or ask your own question.